The Moving Gallery of the Old Omaha Association presents an exhibition of recent figurative and floral drawings along with a site-specific installation by Kristin Pluhacek. Kristin Pluhacek: Drawings is on view in the Garden of the Zodiac Gallery in the Old Market Passageway, January 29 – March 09, 2015 with an opening reception January 29 from 7 – 9pm. Kristin Pluhacek: Drawings emphasizes two bodies of Pluhacek’s practice. The first includes gestural figurative pastel and charcoal drawings rarely seen in Omaha. These intense works combine movement, mass, and proximity. Each drawing was made in front of a live model, or in the studio inspired by the live sitter. These armatures were then used for further investigation. The exhibition will also include a series of close-up flower drawings. This second body examines the micro subtleties of pods and blossoms. 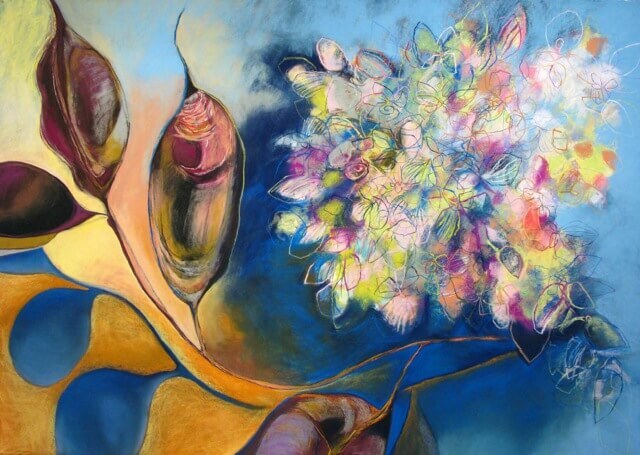 For the artist, they characterize “simple things that, when observed, grow in complexity.” Similar to the figurative drawings, the floral gestures articulate Pluhacek’s interest in strong vibrant subjects and rendering style of living forms. Complementing these figurative and floral drawings is an installation of drawings made at the Garden of the Zodiac the week prior to the opening. The artist will return throughout the exhibition adding new work. Throughout her career as an artist and educator, Pluhacek’s work has been recognized for its assertive handling of color and form. Kristin Pluhacek: Drawings extends this trajectory with more than a gesture of vibrancy and movement.